Roads approach the park from four points along U.S. 53 between Duluth and International Falls. There is a scheduled airline service to International Falls, Hibbing and Fort Frances, Ontario, Canada. Car rentals are available at airports. Transportation and lodging are also available at the park's gateway communities. With over 80,000 acres of water, Voyageurs National Park is a boater's paradise. This is a unique park. With less than 10 miles of roads, visitors must leave their cars behind for a motorboat, tourboat, canoe, houseboat, kayak or sailboat. Adventure into the solitude of a remote lake on the Kabetogama penninsula. Watercraft are available on a first-come, first-served basis. Reservations can be made one week in advance at a park visitor center. To use the watercraft, fill out a visitor use agreement and pick up a key at a visitor center. As about arranging for transportation service to reach the trailheads. 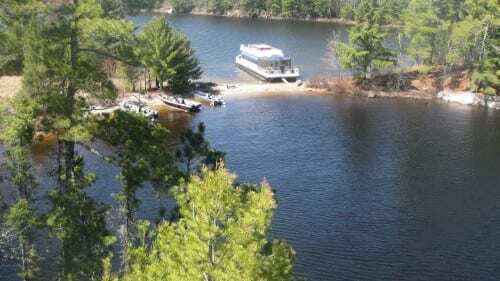 You need a boat, all campsites are accessible by water only. Firewood - Voyageurs Park reccomends people to collect dead and downed wood or purchase from an approved vendor in the area. Approximately 150 Black Bears live in Voyageurs National Park. These bears symbolize the wilderness quality of northern Minnesota and can be an enjoyable part of your visit. Unfortunately, each summer numerous human-bear incidents cause significant property damage. Clean campsites & use of food lockers help prevent campsite closures and the trapping and relocation of bears. If you plan to fish in the park get the Minnesota Fishing Regulations. Know the regulations for transportation, shipment and storage of fish. The Minnesota Department of Natural Resources has established an experimental fishing regulation for Rainy, Kabetogama, Namakan, Sand Point and Crane Lakes.